McKinley Sofa Make your living room or den comfortable and on-trend with the McKinley sofa. Its simple yet stylish design incorporates chic details, like matching piping and gently rolled arms, for elegance that’s beautifully subtle. As for this piece's utility, it's built to withstand your family with its reversible, interchangeable seat and back cushions. Plus, the reversible throw pillows let you switch between solids and stripes whenever you feel like mixing it up. Make your living room or den comfortable and on-trend with the McKinley sofa. Its simple yet stylish design incorporates chic details, like matching piping and gently rolled arms, for elegance that’s beautifully subtle. As for this piece's utility, it's built to withstand your family with its reversible, interchangeable seat and back cushions. Plus, the reversible throw pillows let you switch between solids and stripes whenever you feel like mixing it up. It is amazing that within three months of purchasing the sofa and love seat, that it was already "breaking down". I need to rotate and flip the cushions twice a week, and the couch is already squeaking when you sit down. Only receiving 2 stars, for color and style. So disappointed in the quality. We were looking for a firm sofa that was not too low and we found it with the McKinley. Very pleased with the quality, customer service and delivery. We've had the sofa for only a week but are very pleased. When I sat on the sofa in the showroom, I knew it was exactly what I wanted. I certainly hope it will still look good over time, but right now everyone who sits on it is impressed. It was an easy purchase; I did not feel pressure from the salesman Bruce E, and I would recommend R&F to friends. Purchased the McKinley sofa and love seat from the Yonkers, NY store. Friendly sales people. They were very active and communicated well on he delivery aspect of product. They delivered on time as they had stated.Delivery guys were polite and efficient. I love the sofa so far, and everyone you has seen it, loves the color and style. Have been looking for a Sofa to match two custom upholstered club chairs. This blue is a perfect match, exactly what I was looking for. Love the style and fabric as well. We love this sofa, great quality and fast delivery with care! This is a very comfortable sofa. It is just perfect for our lake house, My interior design is along the line of shabby chic and this sofa fits with the design just fine . We are very pleased with the construction. The sales man was informative and made it easy to find just what we wanted. this was our first purchase from Raymour & Flanigan and we are very impressed. There was no hovering by the salesman, he answered every question and made the entire process a pleasure. The sofa and chair are the perfect size for our apartment, the price was right, the delivery was at our convenience and the delivery guys were pleasant, accommodating and efficient. Raymour & Flanigan will be our go to place for future furniture purchases. Not the same furniture we sat on in the store! Have bought furniture in the past that turned out to be very uncomfortable once purchased, so we were extra careful making a selection before buying this set. Tried out many different sofas in several different stores, and even after our original thought that this might be the one, we sat on both the sofa and love seat for an extended period of time in the store to be sure. It was firmer than our last one, which we wanted, but not too firm, and most importantly the seats were not so deep that you needed to put a pillow behind you. The furniture that was delivered feels entirely different, and is not comfortable! The seats slip forward when you sit on them, and the material is harsh to the touch and actually noisy when you move around on it. So disappointed I could just about cry. Have to say this purchase was another disappointment in a long line of furniture buying mistakes! My frame collapsed on loveseat and only 3 years old!!! They want $225 to fix!!! All made in China and poorly constructed. Never again and will tell every one I know not to buy there. Love the look and style of the couch however the cushions are not firm, after just 2 months of use the cushions are flat and the fabric is not as pretty any more. The couch feels very low now. Kind of dissapointed. The most uncomfortable coach I have every purchased!! While sitting on the cushions you feel like you are falling forward, even guests sitting on the couch have said the same thing. Front base of coach is puckered, service did try to steam out, but quite obviously didn't work. This couch does not feel like the one we sat on in the showroom. We are getting rid of it and looking elsewhere to buy a replacement. We are so very pleased with our purchase of the new sofa . The quality of the merchandise is excellent. The entire process from walking into the store to the delivery at our home was spot on !! Great service and wonderful product. The delivery drivers were polite and fast. The couch is comfortable and looks great. Fantastic quality, very sturdy material, great color - love this in our new living room. Only wish there were more pillow options since the ones that come with it have a very nautical feel to it but I can easily find others to mix in with these. We purchased the sofa and chair and 1/2 in blue. I absolutely love the way it looks in the room. The sofa comes with so many pillows too! We painted the room grey - dark grey for the accent wall and light grey for the other walls and this furniture looks amazing with it. The furniture is comfortable and well made and we are hoping it last for years to come. I bought the warranty as well since I have 2 kids and a cat . Fast delivery and processing, attentive staff and deliverers! The couch color, fabric, and pillows look great in my living room. The cushions are a little firm, but I think with use they will soften up! We purchased two of these sofas for our beach home. The color and pillows look a bit nautical and that was the look we wanted. The cushions are firm, but do-able. The dark blue color will be helpful as this poperty is a summer rental. There are a lot of pillows which make the room look a little messy when you are using the sofas, but I guess I can always take a few of the pillows away. They do look awesome though, when I have cleaned up and put the pillows in their proper arrangement. We are on the third floor, walk up, but the delivery went very smoothly. The two delivery gents were friendly and courteous and did not damage any walls, ceiling or furniture. I would recommend. Thank you. Sofa very nice and satisfied, but delivery date fouled up by R/F and had to wait another 4 days beyond scheduled date. After 1 year this couch has a sag in the middle from one 205lb person sitting on it. I am sure it will break soon. Junk! Very disappointed in this sofa, loveseat and chair. The cushions are showing pilling and wear after just a few months of use. I would definitely not recommend purchasing this product. I suspect we will have to replace in a year! This couch is perfect for our sitting room! It is stylish and comfortable! We love this couch. The deep navy is beautiful and the couch is very comfortable. I love that the seats are not deep. You can sit on it without feeling like you're on a day bed. It feels like a sofa should! The material is thick and I think it will hold up over time. Nothing bad to say. Love sitting on it! Great sofa glad I purchase it very good , Thank you for the team effort . Love you all for helping me again. EMILIO. I love this sofa. It's beautiful and really compliments my decor. The set looks great. Well made and comfortable. Delivery was perfect. Very happy with the whole experience. Very comfortable. I love that the cushions are all removable so you can adjust them for your comfort. Comes with FIVE reversible throw pillows. We really like it. It is comfortable and pretty and fits nicely in our old home. So many sofas are over-sized. This one is just right. Will send photo when room is finished, sofa is great as is the matching Love Seat waiting to order coffee table then will send photo. Looks terrific, was also very happy with End tables. As soon as I saw it, I knew it was the one. Love the color, fabric & it's very comfy. I purchased this couch and the matching love seat. I absolutely love both items. They are well constructed, comfortable and look beautiful in my home. They were both on sale and the pricing was very competitive. I would definitely suggest this item to others. The sales staff were helpful and good customer service agents. All the way around, this was a positive experience. Also patient as my sofa went in basement . 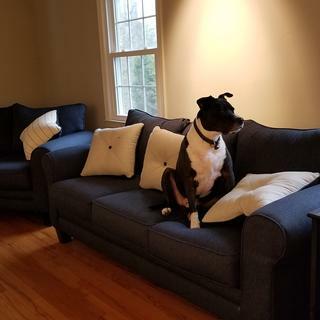 The cushions are firm, it has a nice color against our newly painted walls and the lighter colored pillows give it a nice balance of dark and light colors. I like the couch and love seat very much. Looks great and very comfortable. Highly recommend. Came with too many decorative pillows in my opinion. I won’t be using half of them. Very happy with my purchase. Sales staff very nice and helpful too. From the shopping process, great service and easy on time delivery, to a great new, well-made sofa. Shopping should always be so easy!! Nice combination of comfy and neat. Easy to move, solid, delivery very professional. I love both pieces and all the pillows. Everything fits perfectly in my family room. My sale associate, Christopher K. was very helpful,extremely knowledgeable and highly professional. This is my second set of furniture for my family room in 17 years, so coming to Raymour and Flanigan, I'm confident that this furniture will last as long. The Sofa is so pretty! A great fabric and looks great in our living room. The Blue is just what I wanted. We are taking a few pillows off...just one too many! Love Love Love the look! BEST ANSWER: With the feet and back cushions removed, the McKinley Sofa will fit through a 26" space. I recently purchased the McKinley sofa and loveseat in blue. Are there any plans to expand the line and offer an ottoman for the chair or an accent chair that coordinates with the blue sofa, similar to what's offered for the red version? BEST ANSWER: The McKinley collection is a wonderful grouping, but unfortunately there are no immediate plans to expand with additional items. Is this sofa made in the USA? BEST ANSWER: Yes. The McKinley Sofa is manufactured in Mississippi. Is this fabric a chenille? BEST ANSWER: The upholstery on the McKinley Sofa is actually closer to a denim, or almost a canvas texture. how many double rubs can this 74% polypropylene//26% polyester upholstery withstand before tearing? BEST ANSWER: The upholstery on the McKinley Sofa is able to withstand 15,000 double rubs. I would like to see an ottoman for the Mckinley collection. However, would the Anastasia Ottoman in turbo sand match to the blue McKinley with the pillows it has ?? Would the heights work together ?? BEST ANSWER: The Anastasia Ottoman is a very close match to the pillows on the Mckinley Sofa. They would coordinate in color and height. what color is this sofa... really? BEST ANSWER: The McKinley Sofa is navy, which looks like a denim blue. We do our best to photograph the furniture to look as true to life as possible, however differences in computer monitor settings and lighting can sometimes make it difficult to determine the actual color. Does your furniture contain fire retardants? BEST ANSWER: The McKinley Sofa does not include fire retardants. I see the fabric is polypropylene. what is that made out of? BEST ANSWER: Polypropylene is a type of thermoplastic polymer resin which, when combined with polyester becomes a very durable upholstery. Does this material pill? You know, those tiny little balls that form????? BEST ANSWER: A little bit on thé arm of thé chair. Not on thé sofa. We've had the sofa almost 2 years now and there is no pilling. The sofa still looks new and is still firm. It didn’t until I got a puppy! So if you are dog zone free you are fine! No. It does not pill. Fabric is very stable. What color wood are the feet? BEST ANSWER: Looks like a dark brown to me. Very pretty yet practical couch. Should match any décor. BEST ANSWER: My two sofas don’t seem to have faded at all. They are in a room with lots of natural light from 6 floor to ceiling windows and also a double french door . They seem be holding up very well with a house full of teens all the time and a very active Black Lab who is allowed on the furniture. Good stuff for good price !! 17 months old and it has not faded. One chair is in front of a deck slider, although not direct sun it’s bright. What type of mattress is in the sleeper, innerspring or memory foam? BEST ANSWER: This specific sku 200211302 Mckinley Sofa does not include a sleeper mattress. If you search by SKU: 260211304 Mckinley Queen Sleeper Sofa does include an innerspring mattress. The sofa does not have a pull out sleeper. How tall are the feet on this sofa? BEST ANSWER: The height of the removable feet are 4". Can I buy just seat cushions for this sofa? BEST ANSWER: Hi Janet, just to clarify, do you own this sofa and need replacement inner cushions? Is sofa able to be delivered dissembled and assembled at the home? It will not fit in my elevator and the stairs the ceiling is too low. BEST ANSWER: Hello Tania, thank you for your interest in the Mckinley Sofa! Without the back cushions, the frame height is 36.5" This is also has removable feet that are about 4" in height, so it will be able to fit through a standard door frame. Depending on the measurements of the elevator and staircase, it may be a tight fit. I would recommend measuring and contacting our online sales department at 866.383.4484, option 2. Our associates will be able to answers detailed questions about delivery! BEST ANSWER: Hello, Kathy! Thank you for your inquiry. We would be happy to assist you in finding a specific solution for your recliner needs! Please contact the online sales department at 866-383-4484 option 3. Does the sofa have a protective coating for liquid damage? The McKinly sofa used to come in red also, is it no longer available in the red? BEST ANSWER: We currently do not have McKinely Sofa in "Red" available in stock, however you can special order this piece by visiting your local showroom or contacting our online sales department at 866.383.4484, option 3! Does anyone know the height of the feet? I have a narrow hallway in my apartment building, its about 42" wide. The issue is turning a sofa to fit thru the door way. My door way height floor to ceiling is about 72'. Do you think I would be able to get this into my door? if not is it possible to deliver the sofa in parts and assemble it in my home? BEST ANSWER: With the feet and back cushions removed, the McKinley Sofa will fit through a 26" wide space. Although every delivery situation can differ, it sounds as though the McKinley Sofa will work for your space. Is it possible to purchase replacement seat cushions for the McKinley sofa? Does this fabric contain flame retardants? BEST ANSWER: The McKinley Sofa is not treated with flame retardants. Hello, what are the feet made of and are they removable? BEST ANSWER: The feet are made of wood. They are removable. BEST ANSWER: The McKinley Sofa includes reversible and interchangeable seat and back cushion. Is this a normal size sofa or larger than normal? BEST ANSWER: The McKinley is considered a normal size sofa.